It's officially-official, this is FT's MLP thread. Until we get enough pony-fans for an entire pony board. 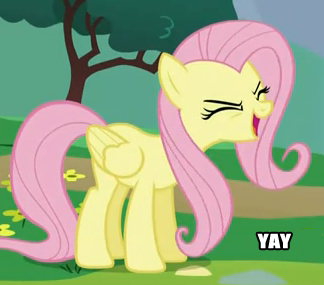 Ah, a renamed MLP thread, I thought I heard burst of explosions that could only be rainbows, outside of my window. About 20% cooler, I think. How did this whole epidemic of a meme start? I just downloaded episodes 1-10. I was all "well, maybe I should just check this out..."
I found a custom MLPsona maker thing! Everyone's probably already seen this, but yes! So Lance, Enrique and Spaz tied me to a chair and forced encouraged me to watch the first episode today, finally. So, being the social creature I am, I finally caved and did. That and they said I'd lose my place on the staff if I didn't. I liked it, I'll admit. I mean, it took me a half hour to get through the first three minutes, as the experience was akin to trying to swallow a bag of sugar in heaping spoonfuls. But once the theme song was over and things were underway, it wasn't all that bad. Cheesy and the like at points, but I am nearly a grown man watching a show geared at little girls. I'll probably end up watching more sometime, but for now I'm going to try and counterbalance it with some hard rock and try to stop picking out Duino's cutie mark. Duino's Cutie Mark is an Acme anvil. NOT DUINO TOO!! Curse you (lance;enrique;spaz)! Cuuuuuurse you!!! !